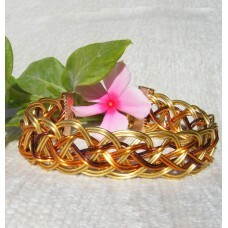 Shiny gold, brown and orange wrapped wire braided bracelet. 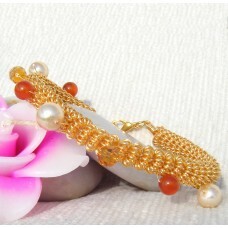 Many wires are wrapped together in ..
6mm frosted beads connected with orange and brown seed beads and surrounded by AB crystal bicones. 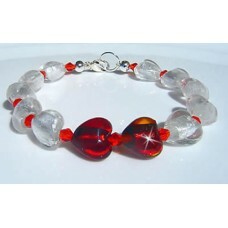 &..
White foil glass hearts surround two focal red foil glass hearts bracelet. 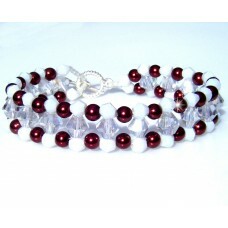 Perfect give for a loved ..
Beaded Bracelet. 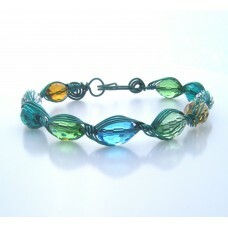 Green and Blues multi faceted oval beads. 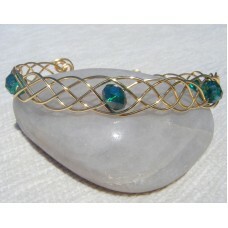 Wrapped in a feather wire pattern. 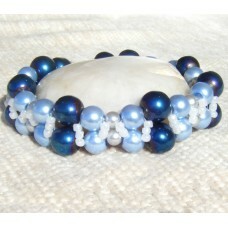 Size 7..
Hematite blue 6mm beads and sky blue 4mm beads linked by pearlescent AB coated seed beads. AB (.. 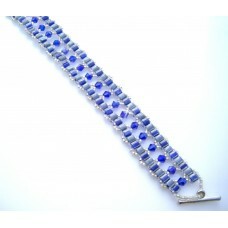 Shades of blue, grey and white glass square beads joined together to form a bracelet.Length: 7 inche..
Made in 3 parts, the centre of this delightful bracelet is first braided on a kumihimo disc. 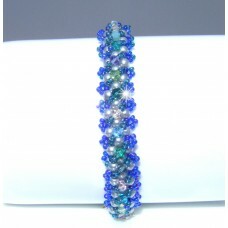 T..
Blue spaceship shaped glass beads separated with pearlescent light blue 4mm beads on an elasticated ..
Blue swarovski Rondelle crystal beads 8mm and silver plated curly bracelet.Bracelet will be in a pre..
4mm Silver Grey Pearlescent Beads with Pearlescent sapphire blue seed beads and hues of blue bicone .. 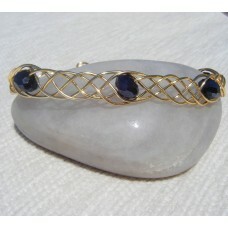 This bracelet just screams class! 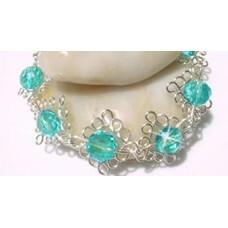 Glamorous tones of silver and clear AB bicone crystals that .. 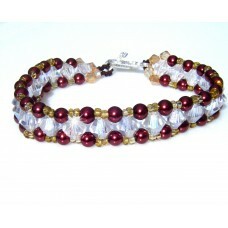 Bronze coloured pearlescent 4mm beads alongside gold coloured seedbeads are centred with clear 6mm A.. 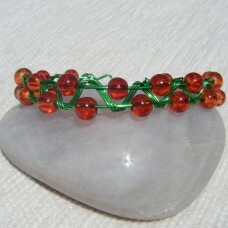 Bronze coloured pearlescent 4mm beads alongside white bicones are centred with clear 6mm AB coated B..
Wire zigzags between the crackle glass beads on this green and amber coloured bracelet. 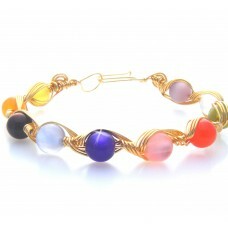 Beads ..
Multi coloured cat's eyes glass beads connected by a gold plated wire to form a piece of jewell..
Celtic gold plated and black coated copper bracelet. 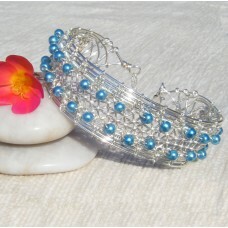 Minimum 7.5 inches (19 cm) adjustable to .. This is just superb. 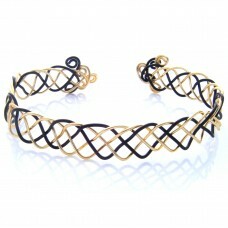 Celtic Gold plated twisted bracelet with embedded black coloured glass be..
Large green glass beads embedded into a gold celtic pattern intertwined classy bracelet.Size: 19.05 ..
Non-tarnish gold plated coiled wire bracelet with beads. Sturdy and chunky. 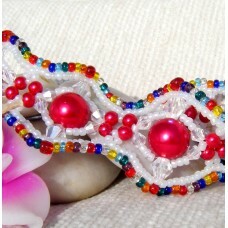 Delightful b..
Wavy design bracelet with 12mm pearlescent red beads surrounded by white AB coated seed beads, AB cr.. 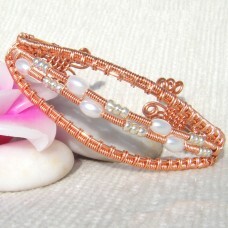 Oval pearlescent glass beads and silver seed beads are captured on this non-tarnish copper wire brac..